And of course, please chime in with the books that didn't grow up for you. Andy: These wonderful children's books that played upon the hopes and dreams of all young athletes were a staple of my childhood. When my friends and I weren't reading them, we were trying to write our own stories. But that was only until we realized that every story was the story of an athlete who had one problem on the field-and another off the field-that while seemingly unrelated, had a single solution that somehow solved both. Sarah: I really don't remember much about these other than the covers and how there were tons of them in the teen section in my library. I read some of them, but mostly I liked looking for them to buy at the used book sales-for some reason I thought I would someday read them all and wanted to buy the ones I came across. Each one featured a girl in some historical setting who had to pick between two boys. I picked Elizabeth as my sample cover because the hair is what makes the cover. Here's a list of all the Sunfire books-you so want to go read them now don't you? OK, I have to admit, I read the Sweet Valley Twins a lot more over the SVH. This was anot her series I got hooked on and devoured. I even watched the TV show. I have to say I was always more of an Elizabeth fan over Jessica, but I was always eager to read about the Wakefield twins, super specials, spin-offs and all. You know these are going to be bad when in the author's bio her other works mentioned have been turned into after school specials. On a funny side note, according to the Wikipedia entry on Sweet Valley High, the series was criticized for it's unrealistic portrayal of teens and outrageous plots. The first two examples? "The twins battling a werewolf in London" and "Jessica falling in love with a vampire" And yes, there's a snarky SVH blog too. Andy: Another classic from my childhood, it's not hard to understand why this series does not hold the allure it used to. First of all, it's about a bunch of talking rodents. And with all due respect to Disney, at this point in my life, small furry talking animals just don't do it for me anymore. Secondly, large passages of the book were devoted to the description of British food, which by most accounts is disgusting. And finally, aside from these minor annoyances, the fact that every story has the same plot takes away from the mystery and wonder that this series originally held for me. -This never was a favorite, but we both agree it doesn't grow up well! Andy: Perhaps the creepiest children's book ever written-and that includes Alice in Wonderland. Sarah: Yes, that poor guy-I don't think he ever got married. Andy: No, he has children. Sarah: No, I think he stole them. Besides, we never see them, so how do we know they're really there?? who now with children of his own, who were very possibly stolen-sneaks into his mother's bedroom into the dead of night to cuddle. Sarah: No man can be normal after reading this one. Andy: I think Edward (Cullen) might have read this one as a child. Your turn-what book didn't grow up? Thanks so much for this (Both Sarah and Andy) I usually just read, but I had to post! This really made me smile! I'm having a giveaway, I hope you'll come by and enter before Friday! The Nancy Drew mysteries didn't age well for me either. I loved them as a kid, but I tried to read one as an adult and it didn't hold up well. Kat-Same here! I didn't read many Nancy Drew and when I was a teen I tried the Nancy Drew Files-not something I'd want to read now. Another series that just does not age well? "Goosebumps." But it's still checked out at my library! It's hard to believe I was ever scared of those books. And I agree about the BSC. I made my own Kid Kits and had meetings and...only sat for my sister. I tried so hard to be a true babysitter! When I was at the bookstore, I had girls come in all the time asking for BSC. I don't know if they read their moms copies or found them at the library, but there's obviously still a market for them. I wished they'd rerelease them in something other than those graphic novel versions. I loved BSC, Sweet Valley and Nancy Drew. Ahhh, the good ol'days. I really loved Christopher Pike and Lois Duncan, but when I read them now I'm like...eh? And I Love You Forever is SCARY! LOL. I loved BSC and SVH/SVT although I must have stopped reading before the vampire/werewolves stuff. I haven't revisited those but like I mentioned on another post I did reread Vampire Diaries and was disappointed. Surprisingly I also reread another one of her series, The Secret Circle, and still enjoyed those even more so than the Vampire Diaries now. The other series I've been debating re-visiting are The Black Stallion books and The Box Car Children. Would hate to tarnish more child hood favorites though. And I don't know about my new library, but at my old library the Redwall series still checked out regularly! I never read it as a kid and I tried to read it as an adult and just couldn't stand it. 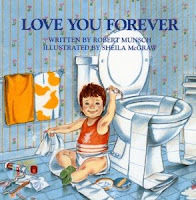 My mom used to read my sister and I that "Love you forever" book. Isn't that the one where she breaks into his house when he grows up to kiss him goodnight? If it is, that is truely the creepest childrens book ever. BSC & SVH are each taking up a shelf and half of space at our library and I have been contemplating removing them since they haven't been checked out in a really long time! Redwall is still popular here but I do hear from the kids"Boy they eat alot in these books they are always having a feast!" Dan-Yep, that's the one where the mom drives across town, crawls in the window and cuddles the son. Plus I always found it weird she crawled across the floor all the time. Creepy book!! Redwall is still popular at my library, but the other series don't seem to check out as much. I loved this post. A couple months when I had my neice for a week, she wanted me to read her a story before bed so we started reading one of the BSC books. While I was reading, I couldn't believe how boring it was! I use to read those all the freaking time. But of course I always thought the Girl Talk series was much better. I mean it had the coolest chick ever, Randy with her spikey hair. Also the Boxcar Children, Goosebumps (me and my friends even formed a club in the 4th grade), and the Fear Street books. My mom, still to this day, loves Love You Forever. Like you, I find it creepy. did as a kid too. Very creepy. I am a huge fan of the BSC books to this day, I still own them all, but... I know they don't stand the test of time. I keep them out of nostalgia and nothing more. And wow, Sweet Valley. Talk about the Gossip Girl/A-List, etc of its day. Loved them then, not a fan now. I was also a big reader of Goosebumps which still get checked out at my library like crazy. Also a fan of the Sleepover Club which was a very small series. I don't know why I liked clubs so much as a kid. I completely agree about BSC and I even started with Baby-Sitter's Little Sister. I spent a year with PURPLE GLASSES just because Karen had them. Pictures from that year have all "mysteriously" disappeared. I agree about the babysitter's club books - loved those! I've never been able to get through the I Love You Forever book without crying. I'm so glad that you guys mentioned the creepy factor. I hadn't really thought about it that way, so hopefully if I read it now I won't get so emotional - just creeped out. LOL!